The most classical form of dance providing students with a foundation that translates into all other styles of dance. Ballet teaches essential techniques to develop poise, balance, precision and grace. Students learn classical ballet positioning through exercises at the barre, continue with center floor and across the floor progressions/combinations. Dancers will also see progress in flexibility, strength, and body alignment. An intermediate form of ballet designed to strengthen technique and ankle-strength to prepare dancers for Pointe. 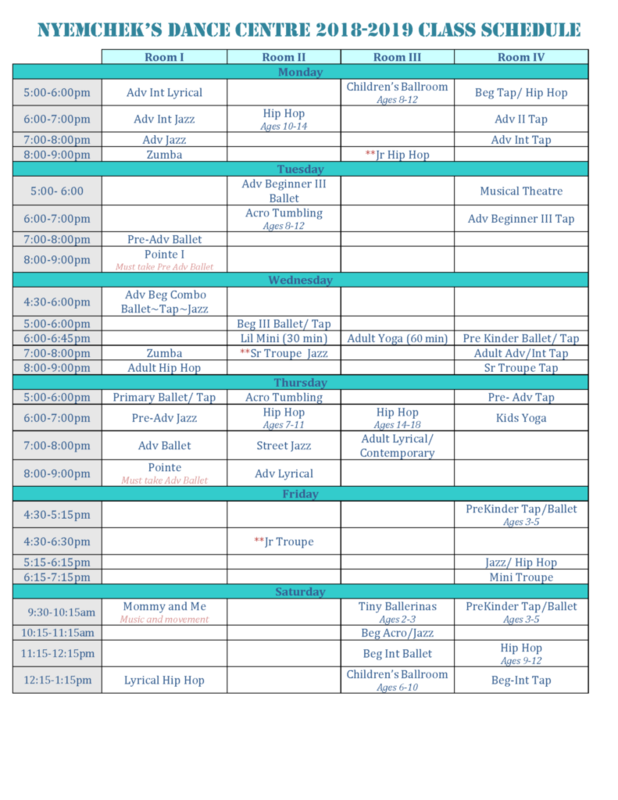 Pointe classes are offered for advanced ballet students based on instructor evaluation and recommendation. This class furthers the dancer in this classical art form which requires a solid technique and understanding of ballet. Want to dance like your on Broadway? Jazz is one of the most popular forms of dance in America emphasizing technique and mobility and body control. With it’s strong connection to modern music, Jazz builds strength, coordination, increases flexibility, and improves endurance. This up-beat dance will teach students turns, jumps, leaps and other jazz basics while developing personal style. Where the feet are quicker than the eyes, Tap focuses on rhythm, sound clarity, patterns, timing and variety speed. Tap is a unique style of dance that uses the tapping of toes and heels to create rhythm. Students get to enjoy this energetic form of dance while being the dancer and the music at the same time and create their own style and sound. Lyrical lets dancers combine ballet and jazz technique while putting a strong emphasis on the lyrics and emotion of the song. It is designed to convey musicality and emotion through movement, allowing students to use dance to interpret the music and tell a story. A popular style for the classically trained dancer combining qualities of ballet, modern dance and jazz. Much of the movement showcases the dancers’ strength and control. It teaches students to test limits and take risks with their mobility with a unique blend of athleticism, hard lines and fluidity. Popping, locking and breaking. A modern fusion between jazz and street dancing – personal style and creativity are very important. Hip Hop is high energy, athletic, fast-paced and a fun way to learn the latest combinations and routines seen on TV and move to the beat of today’s popular songs. A hip hop influenced style of Jazz with a sense of structure commonly seen in music videos performed by your favorite pop artists. An invigorating class that incorporates stretching, flexibility and conditioning. Students will cover basic elements of acro-mobility and tumbling including handstands, cartwheels, front and back walkovers and more. Whether experienced or new to yoga, learn proper alignment through poses, and understand each pose as it resonates for you personally, within your body. Practice breathing techniques, body awareness, balance, stretching, and strengthening. Latin-based fitness program for all levels of fitness. No dance experience needed. Just a fun and energetic dance and fitness program that will keep you coming back for more. Tap is characterized by using the sound of tap shoes striking the floor to create music. Our adult classes will build strength in the legs and feet in addition to increasing flexibility in the hips, knees and ankles. Tap dancing develops a great sense of rhythm and timing. Inter & Advanced Jazz & Tap Students may wear a Sleeveless Form-fitting Supportive Athletic Top.